Crystal Light has recently introduced its newest product, Crystal Light Liquid. It seems like a better tasting, healthier take on the MiO brand concept. 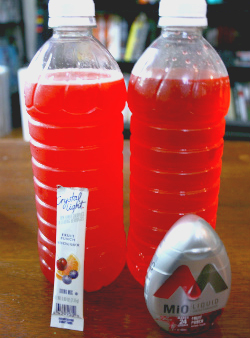 Just like MiO, Crystal Light Liquid is a liquid drink mix that one can add to any glass or bottle of water, eliminating the mess and the science of powder drink mix. There are currently six favors to choose from, including Strawberry Lemonade, Blueberry Raspberry, Iced Tea, Mango Passionfruit, Peach Bellini, and Pomtini. Not only are the mixers 0 calories, they are also gluten-free. It’s Crystal Light’s way of saying that one can now “indulge in all your favorite flavors without the added calories.” In addition, its compact packaging makes it easy to take anywhere on the go. I think Crystal Light has done a better job advertising their product. I specifically like their television commercials for it, because they are quite interesting. They feature several glasses of water; each with a different amount of the liquid mix in it, while in the background there is a woman’s voice saying “I like to think of myself as unpredictable”. There are other similar commercials with the woman saying other things about her mood or personality. The idea is that one can put in as much or as little of the mix as they want, to suit whatever mood they may be in. “Six Flavors. Zero Calories. Endless Possibilities. For Every Shade of You.” This is an interesting angle to sell to people because they no longer have to worry about how much powder mix to put with a certain amount of water. Instead, the consumer is in power and gets to be the master mixologist. MiO’s commercials are these awkward commercials with these crossbreed animals engaged in conversation. I think it was supposed to be a unique idea targeting a younger crowd, but for me it was a complete miss. 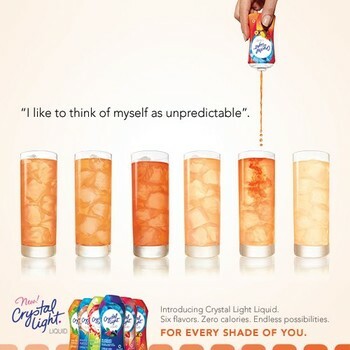 Although MiO gets credit for the originality of the idea, it appears that Crystal Light is firing back full throttle with its own, unique twist on advertising it. Not to mention Crystal Light is already has its common household name to back it up. Which do you like better? Find out for yourself. Keep Calm and Party On? I agree that a really strong point for Crystal Light is that they are already a trusted household brand name. I remember when Mio first emerged hearing people talk about seeing the product, but being to hesitant to actually purchase the product. However, I have seen many people jump at the chance to try the Crystal Light drops because there is already a trust built there. The Crystal Light commercials I think both reinforce this trust and attracts new customers to try out the new product, especially the new flavors marketed towards mock cocktails. Mio however, doesn’t make enough influence to attract buyers with their commericals. I grew up using the powder Crystal Light packets and sometimes I wouldn’t want to use all of the packet at once so I would use a little and then have to find a way to try and save the rest for later. Now that they have the new liquid version of Crystal Light where I can add how ever much I want I am in heaven! Also the fact that it is a liquid also gains my interest because I have never been a fan of a powder substance going into a liquid substance and not knowing if it completely dissolves. The fact that the liquid MIO was out first doesn’t really affect my decision. They had weird commercials and it was a new product I would have to try. Crystal Light is something I am already use to and like you said, their commercials are more relatable and make more sense for us. Personally I drink crystal light, although I have never tried the liquid. I have also tried the Mio liquid and didn’t like the taste. Each product is geared toward a different audience, crystal light specifically young women trying to stay in shape, and Mio more to athletes. I think is marketing is proved successful by the fact that I am a 20 year old female and I drink crystal light.